It’s an exciting time for the YWCA School of Dance- we are starting a competition team! Master classes were held in March and were open to anyone who wanted to try out for the team. 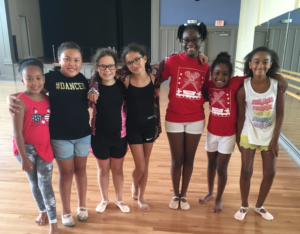 The final selection of 10 dancers was made after the spring recital. Dancers started practice in June and have been working hard to develop skills and learn their competition routines. The team hopes to be ready to compete in the fall. The team will be led by Meghan Foy, an alumna of the YWCA dance program and recent graduate and dance team member of Springfield College. There will be a pre-team class led by Meghan in the fall on Mondays from 6:00 p.m. to 7:00 p.m. for anyone would like to be on the competition team. Please contact Meghan Foy at 860-919-0918 for further information. We are so excited to see what is in store for the team, and wish them the best of luck as they prepare for their competitions.